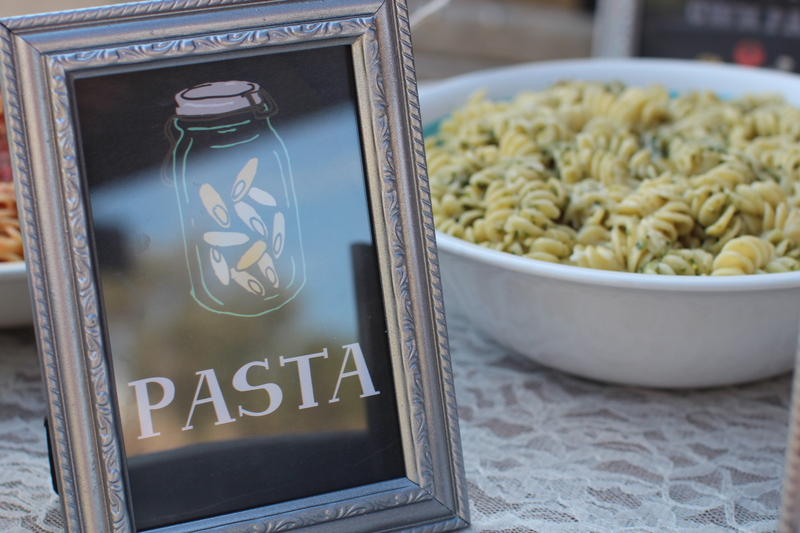 My Grandpa turned 80 this year, & we decided to throw him a PASTA PARTY. Our Grandpa was born in Lucca, Italy and came to America when he was in his 20’s-on a boat. 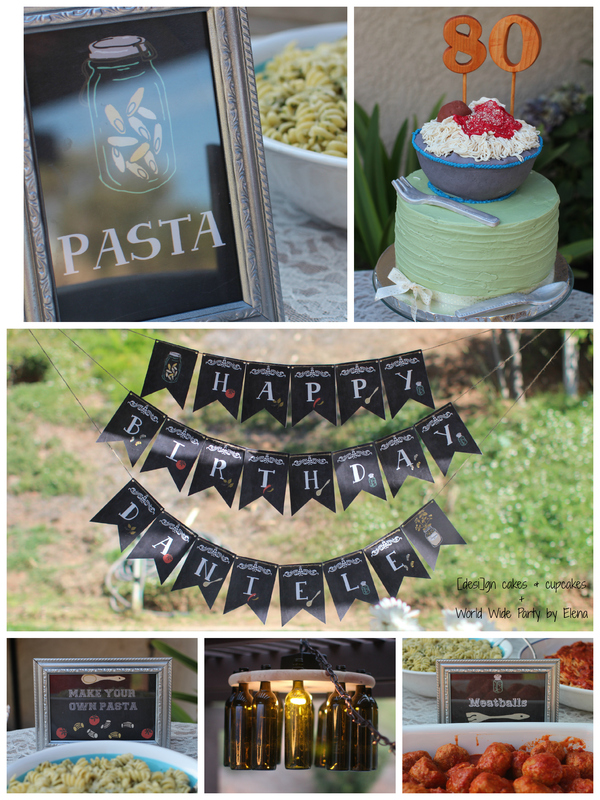 Since this was a big birthday, we decided to invite his brothers and sister over for a backyard party, featuring a pasta bar along with his homemade wine and delicious dessert. When it came to the invitations, I reached out on a facebook blog I belong to. 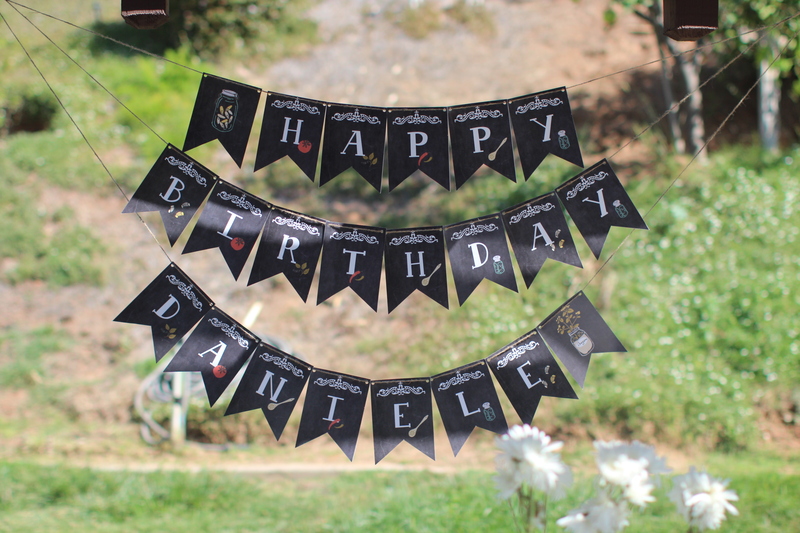 I got an immediate response from Elena of World Wide Party by Elena that she was able to design a custom invitation PLUS a banner and amazing menu cards to match! Elena is amazing-her work is impeccable and all of the work was perfect for our party. 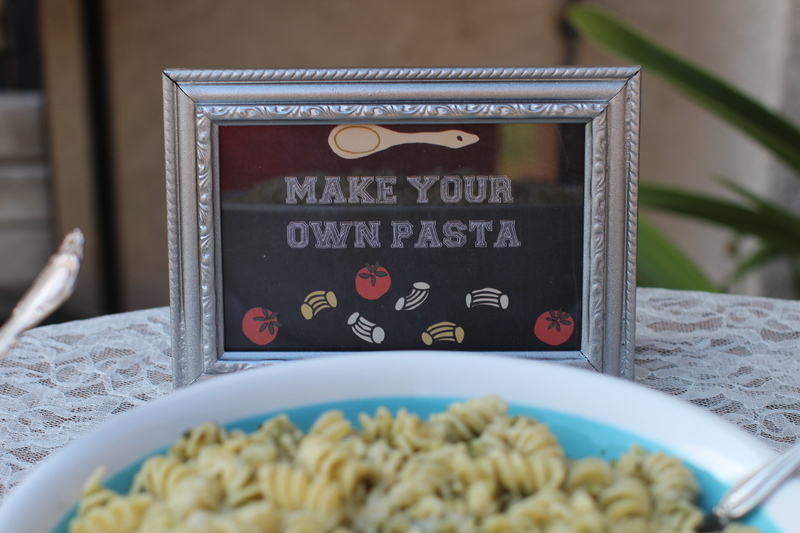 She used a chalkboard inspired background with custom Italian references to match including pasta, chili peppers, and wooden spatulas-perfect for the event! The theme was inspired by his favorite food-pasta of course. First Course was an appetizer course featured antipasto from our favorite Italian Deli, Claro’s Italian Market in Upland, CA. On top of my Grandma’s homemade bread we placed Mortadella, Prosciutto, & Buon Gusto Salami. On the side we had giandiniera, pesto and feta dip, and wine. Our main course menu featured spaghetti and rotini with guests choice of marinara, meat sauce, & pesto-all made by my Grandma, Mom & I. 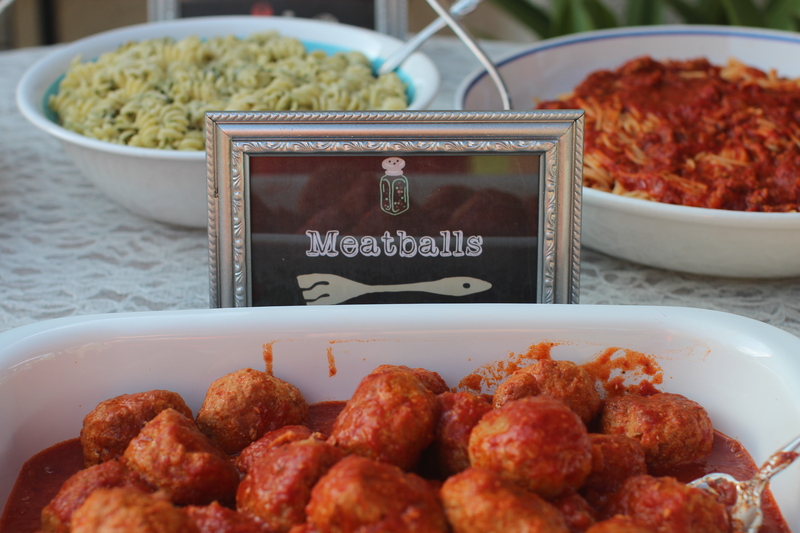 We added a side of fresh meatballs to the table as well so you could top your pasta with as many meatballs as you’d like. My aunt brought a delicious & crisp Caesar salad with fresh Parmesan cheese. 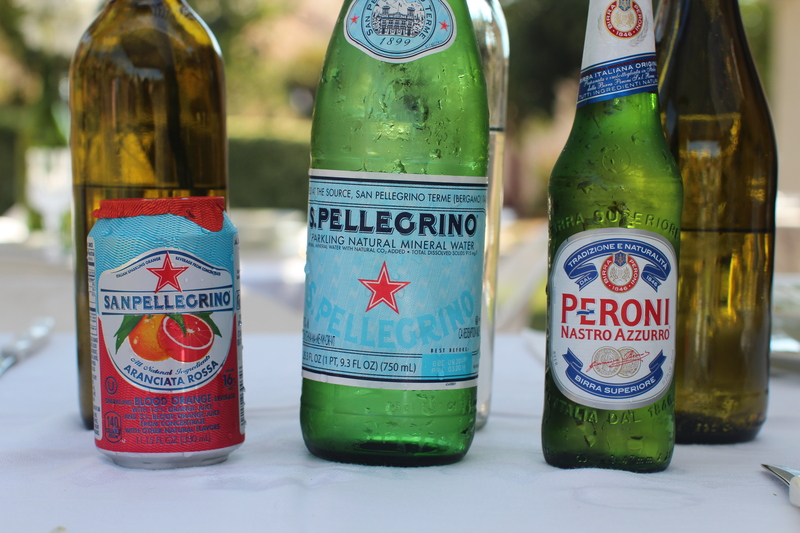 The beverages included San Pellegrino Sparkling water, San Pellegrino Sparkling Aranciata Rossa, & Peroni Beer. 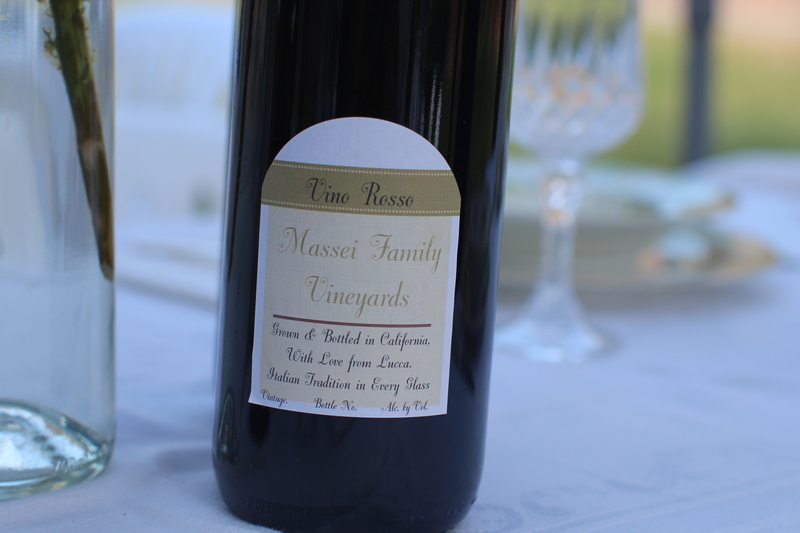 We also had bottles of wine of each table along with water (it was a million degrees that day) and sodas. After the main course there was a cheese and fresh fruit spread that as passed around the tables filled with cherries, grapes, nectarines, gouda, and Parmesan. Now my favorite, the dessert table! I made the cake which was inspired by the party theme itself. The cake was a a 2 tiered cake featuring vanilla cake with a butter cream frosting. The bottom tier was decorated in an avocado green color and the top was a pasta dish. 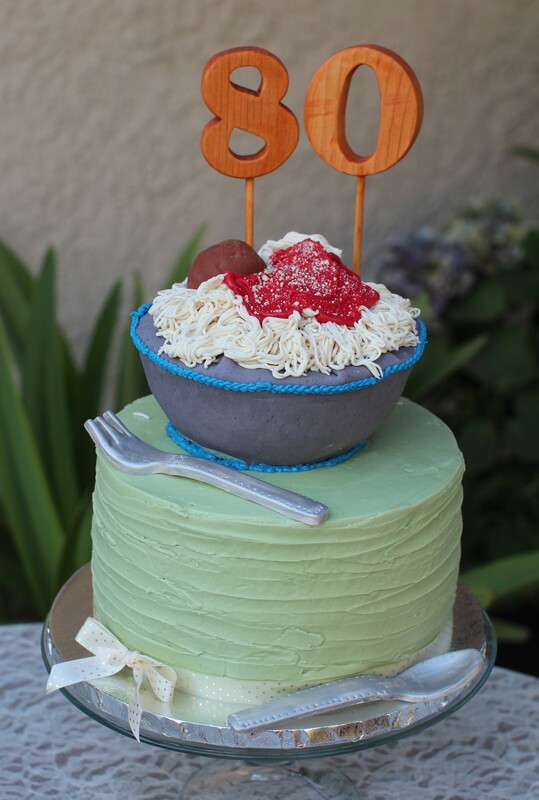 The half dome cake was turned upside down and topped with fondant “spaghetti” that we made with our hand rolled pasta machine. On top we placed a fondant meatball and red icing for sauce. Grated white chocolate was used for the “cheese” accents. The wooden “80” cake topper was handcrafted by my boyfriend for the occasion. It was stained with an Oak color to match the decor around the rest of the party. Also included on the dessert table was my Grandma’s cookie assortment of Biscotti, Savorardi, & Lemon Cookies. 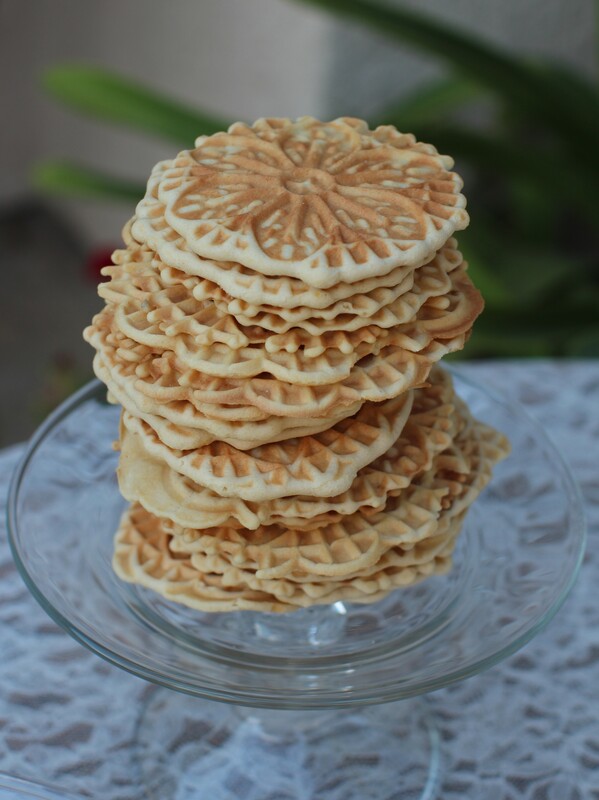 I just purchased a new Pizelle Iron and made fresh pizelles from a family recipe. My Great Aunt brought Apple Turnovers and Rolled Cookies filled with her fresh Fig jam. The tables were placed under the patio and an easy up lined with white table linens from Italy and were set with my Grandmas fine dining set and wine glasses for guests. 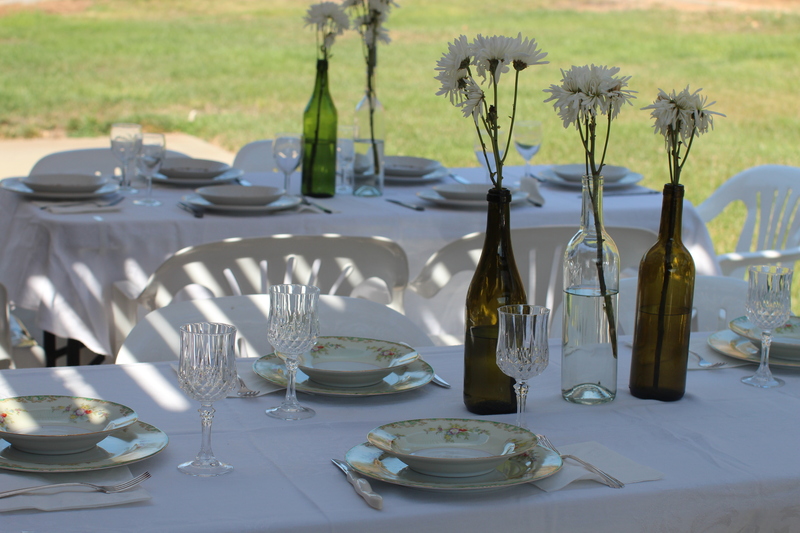 The centerpieces were wild flowers from our local farmers market placed inside wine bottles in the center of the table. 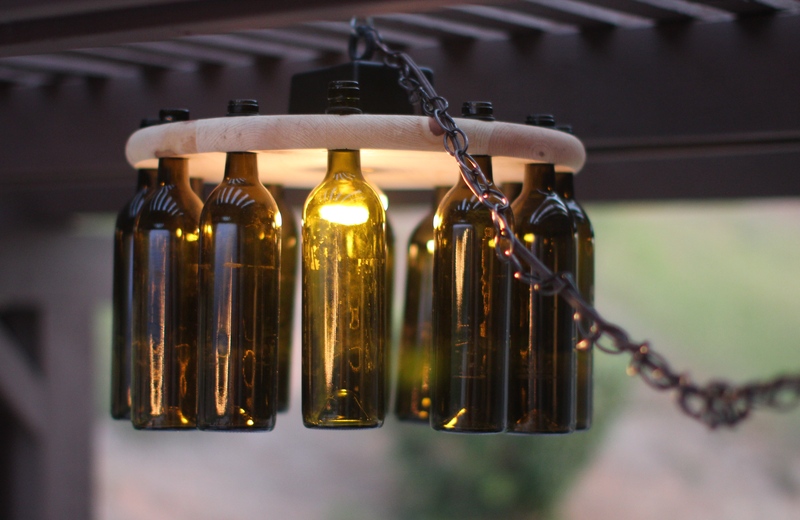 Lighting came from outdoor tea lights which adorned the easy up and the focal point-a handcrafted winebottle chandelier which hung from the center of the patio. It was a birthday present from my boyfriend and I (he made the chandelier from a pine circle and used a light brown tinted bottle from our home collection. The chandelier featured 12 bottles and had a center lighting kit from Lowes. 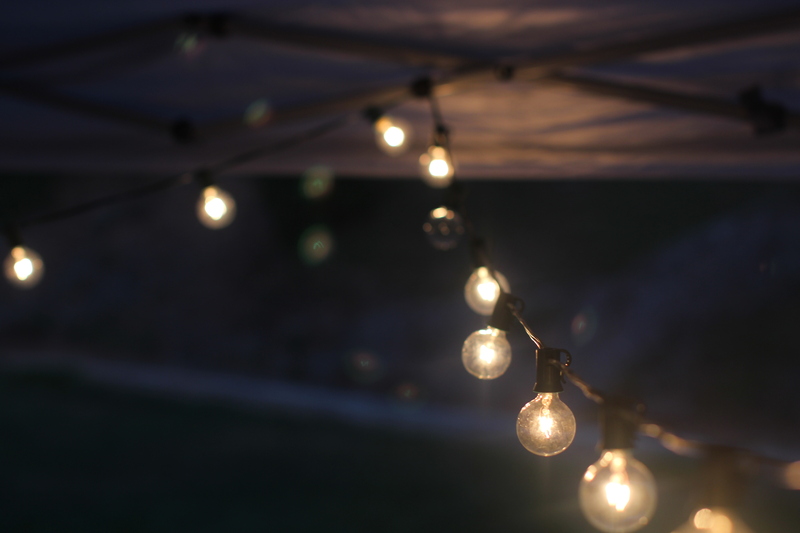 My Grandpa enjoyed his party-the family staying outside all night chatting and listening to our Mambo Italiano station on Pandora-reminiscing of their childhood and catching up. Happy Birthday, Gramps!! We all love you so very much! Previous Previous post: Holy Guacamole! !